Happy Spring everyone! It’s been a while – as usual – but there has been a ton of progress since my last check in. 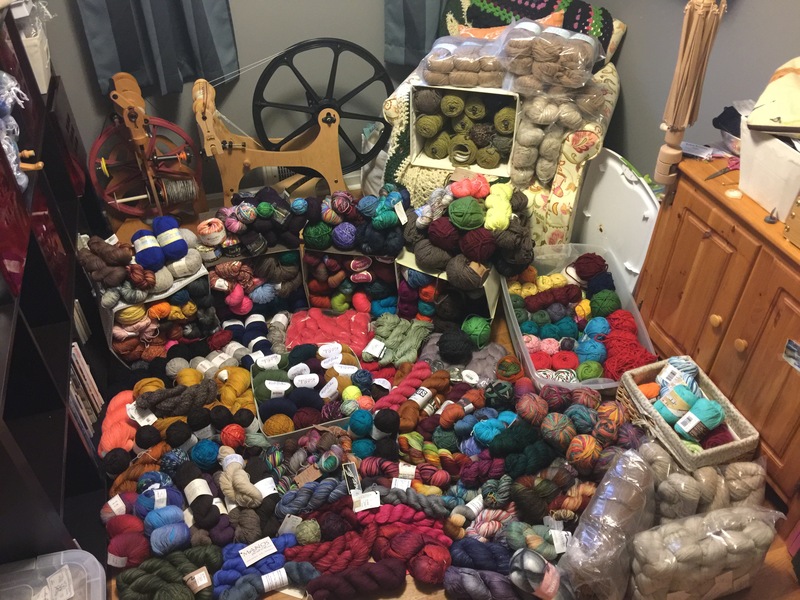 This year, I am attempting to complete a year of handmade gifts. The entire year’s-worth of presents will all be handmade. Okay, so there are two exceptions to this rule, but only because these gifts were actually purchased last year, and it would be silly to hold on to them for an entire year just to prove a point to myself. At the beginning of the year, I made a list of people and events where a gift would be necessary – holidays, birthdays, baby showers. All of them made the list. Even end-of-year teacher’s gifts. Once I knew what I was trying to accomplish – then came the real fun: breaking down deadlines for each gift. In order to stay on top of everything, while still enjoying the holidays, I knew I needed a monthly breakdown. Aside from my niece’s birthday present, which has since been completed, I have been one hundred percent on track, thus far. Let’s also confirm, her birthday is still a couple months away – so the few extra days it took me to complete her present were definitely not devastating to my plan. The sad news? 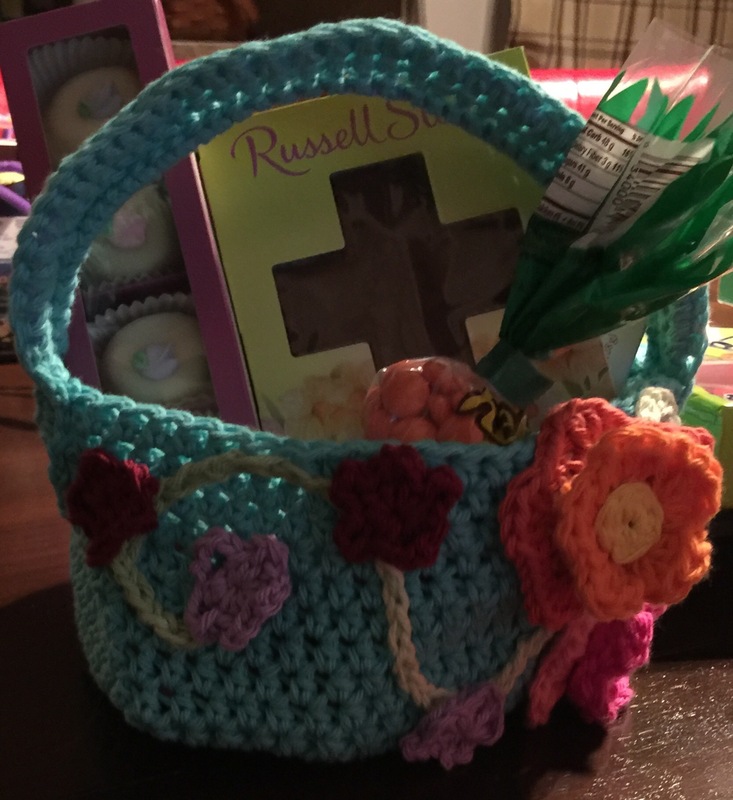 Since nearly everything I am making this year is a gift – pictures may be limited. At least until after I have presented the gifts to their recipients! However, I will be sure to sprinkle in a few other projects here and there that will be safe to post. I know I need visuals, so I’ll try to keep things interesting for you, as well! 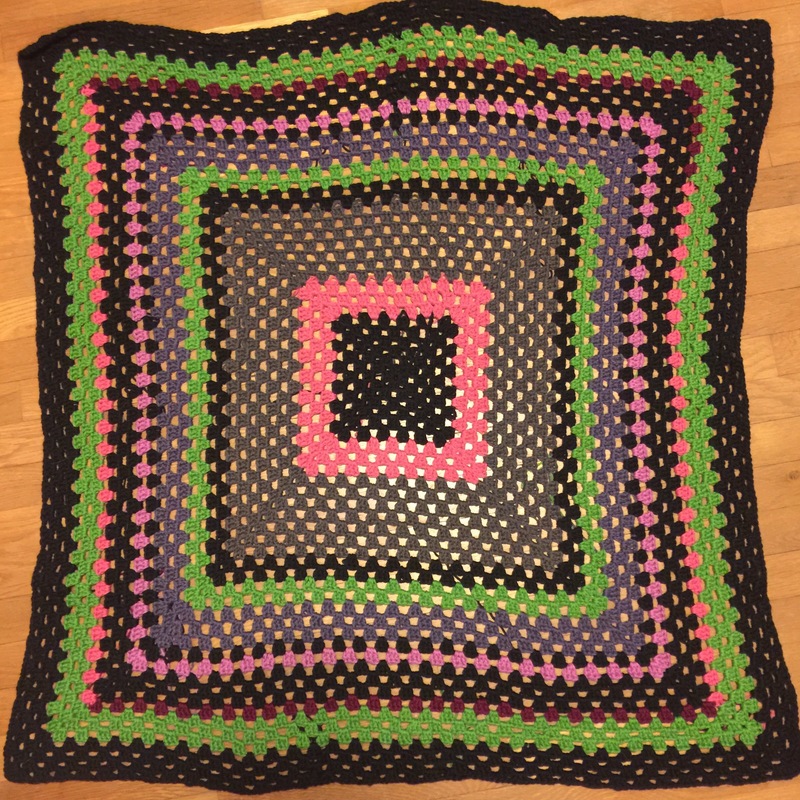 I am glad to say, that I have completed two crocheted baby blankets already this year. The first is seriously overdue (the baby is about to turn 1), and I maybe still have some ends to weave in (finishing always brings me down), but the crocheting is done! Sugar Wheel Baby Blanket by Elena Hunt knit in Knit Picks Brava Bulky in the canary and orange colorways. 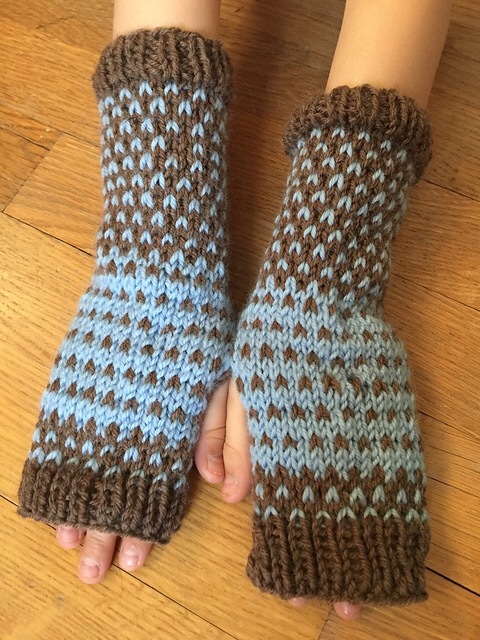 In addition to these blankets and baskets, I have also completed four sets of fingerless mitts using the Lovey Dovey Two Tone Mitts pattern by Jess Brown. (See the below proof that I do actually knit). Knit using Knit Picks Swish Worsted in the wonderland heather colorway and Miss Babs Yowza in the dalmation of purple colorway. Knit using Cascade 220 Superwash in the walnut heather and baby denim colorways. Also knit in 220 walnut Heather and baby denim colorways, reversed. 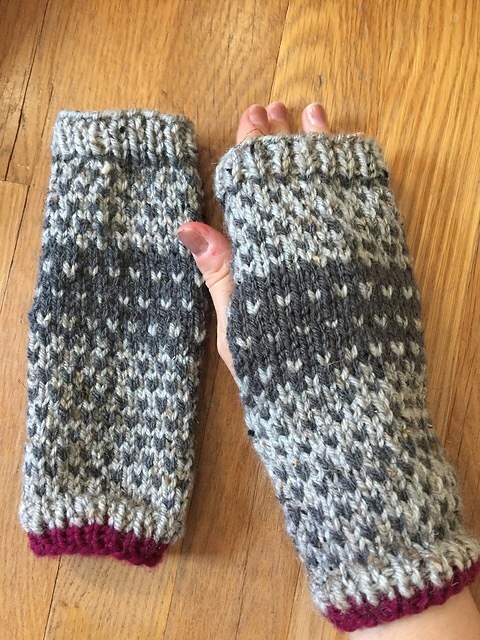 Modeled by M.
Knit using Lion Brand Vanna’s Choice in the grey marble and charcoal grey colorways with a touch of Knit Picks Swish Worsted in the Bordeaux colorway. 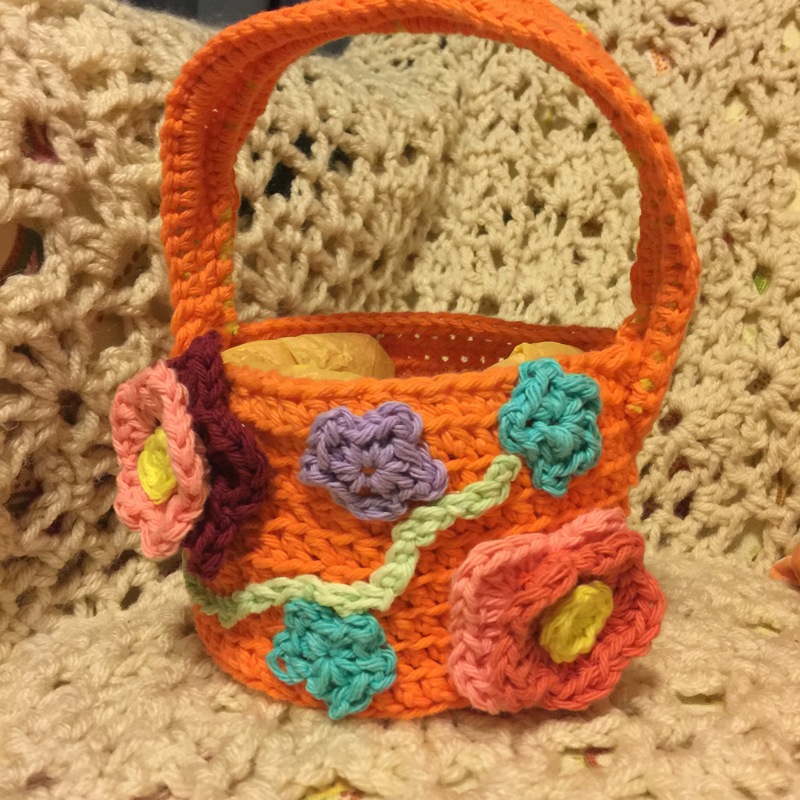 This pattern has proven to be incredibly addicting, as it is fun, SUPER simple and conveniently has been using up some leftovers. 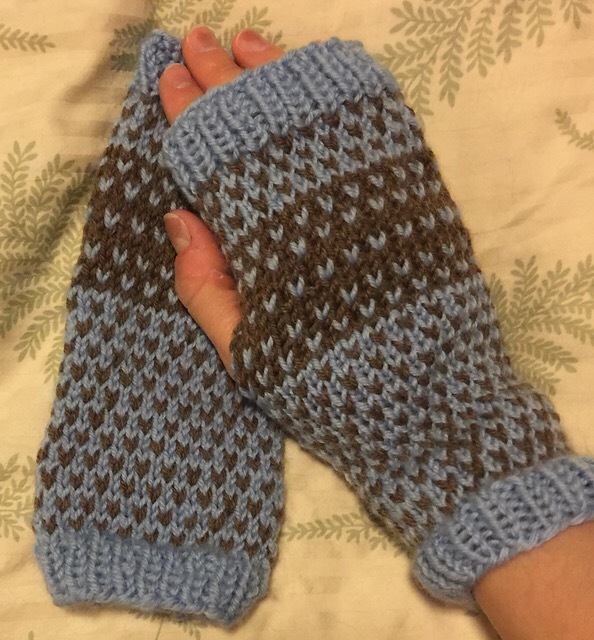 While completing other less-than-mindless projects, these mitts have saved my sanity. Plus, they are the perfect carry along project! M has helped pick out the color combinations for both of her teachers, as well as for herself. The fourth pair may also be gifted (shhhh – it’s a secret 😉 ). 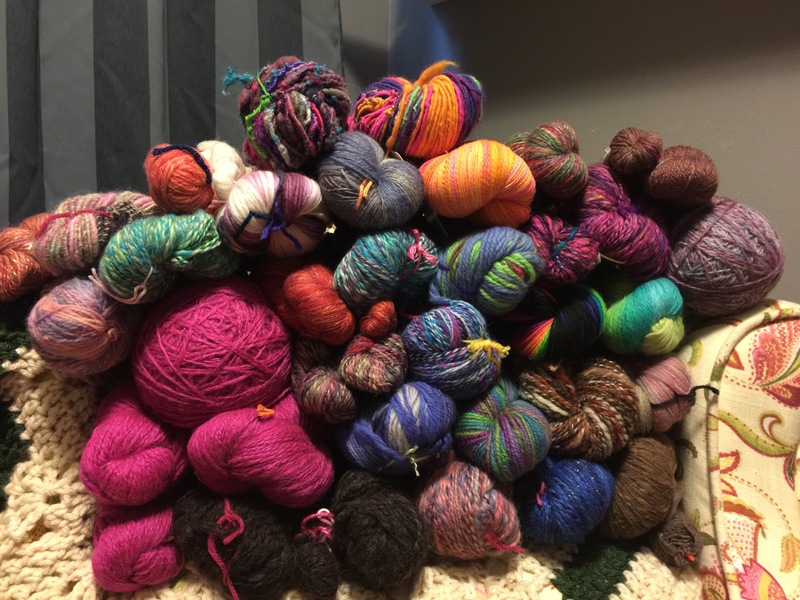 So far, I have completed 18 projects so far in 2017 – totaling about 3,500 yds. That’s more than half of the yardage used for all of 2016. I definitely foresee a very productive year!! I know it may seem late, but what are your crafting goals for the year? Have you ditched your previously set goals and are starting fresh with the new season? Or are you keeping light and just going with the flow? 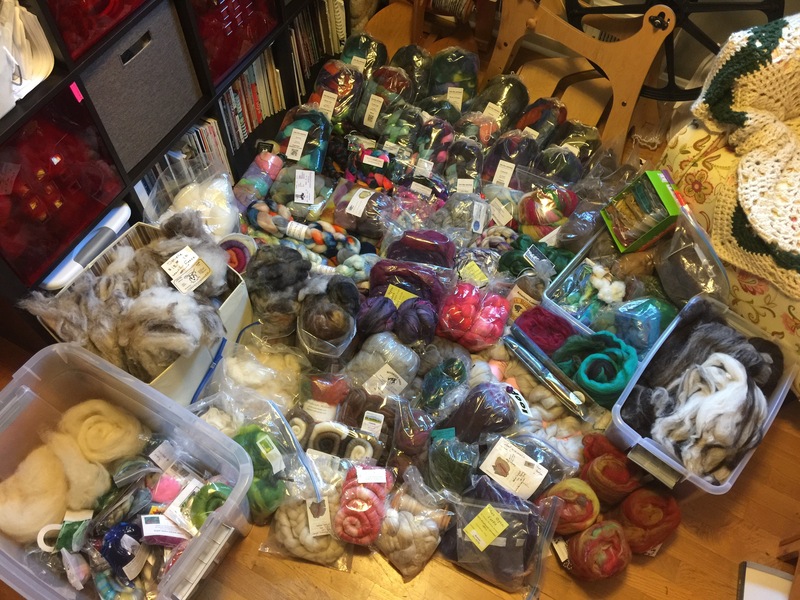 After a year of missing both Maryland Sheep and Wool and New York Sheep and Wool festivals, I couldn’t handle the wait leading up to MDSW this year. Since I didn’t have any purchases that were necessary, we took a different approach than in years past. This was the year M took the lead… and did she ever. For every festival we have attended in the past, my mother has joined us – both to help out so there were two of us keeping an eye on M when she was super young, and to enjoy the festivities. This year, though, my mother opted out so it was just M and I going to our first festival alone. Oddly, it was also the first festival we went without a stroller…. Losing both my mother and the stroller did present some obstacles – especially including me not having a place to put my growing shopping bags and M not having another adult to distract her. But M wasn’t phased. She was so excited to be spending the entire day just the two of us to celebrate Mother’s Day a day early. What I didn’t expect was her shopping enthusiasm. Though, really, she is my daughter. I’m not sure why this was a surprise. I encouraged her to lead me wherever she wanted to go throughout the fair grounds. We made it only steps past the gate before she was pulling me into a booth. Luckily, that was the information booth and I didn’t start hemorrhaging money yet. 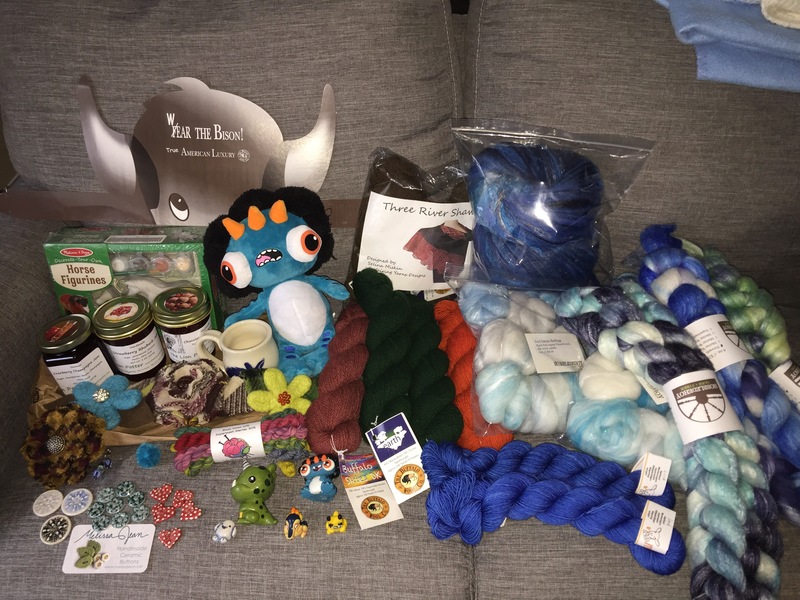 Our first several purchases of the day were definitely for M – she fell in love with a basket, a hand-woven coin purse and a stuffed llama within ten minutes. I then, somehow, managed to convince her we couldn’t buy an entire ceramic tea set at the very beginning of our day as it would likely be broken by the time we would head to the car. I am incredibly lucky, though. She hasn’t lost her love of sheep. We spent the majority of our time in the barns staring at and petting all the different breeds and loving every minute of it. 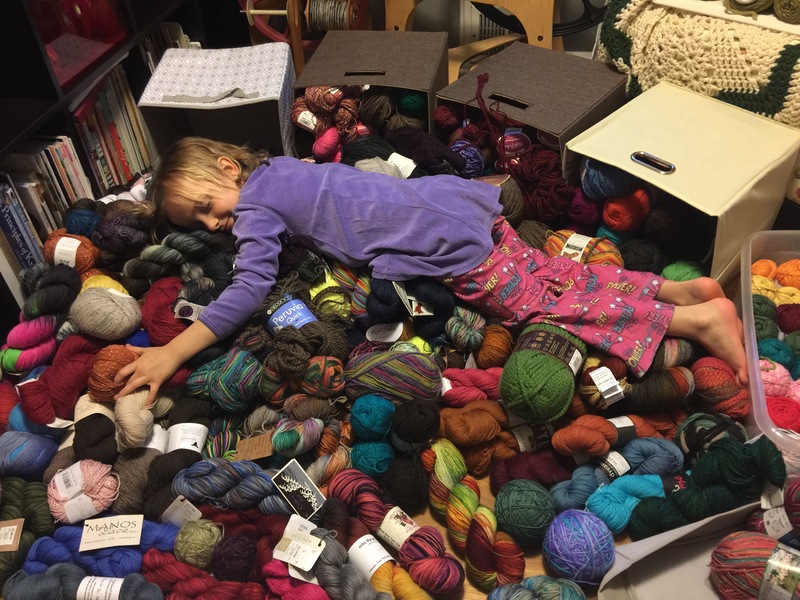 You are currently browsing the archives for the Knitting Goals category.